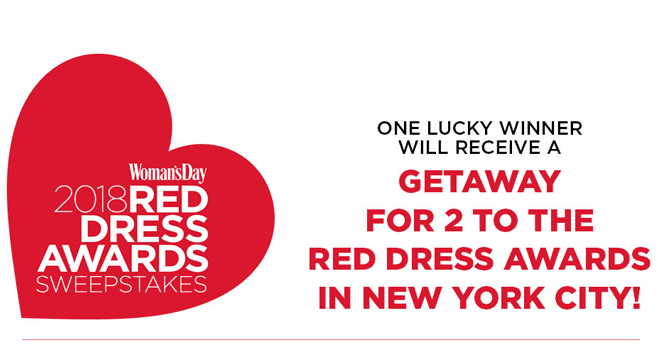 Enter the Woman’s Day 2018 Red Dress Awards Sweepstakes at womansday.com/reddress2018 and you could be the lucky winner who will receive a getaway for 2 to the Red Dress Awards on February 6th, 2018 at Lincoln Center in New York City. Go to womansday.com/reddress2018 on a computer or wireless device and fill out the form. Limit one entry per person for Sweepstakes. The Woman’s Day 2018 Red Dress Awards Sweepstakes is open to legal residents of the 50 United States and the District of Columbia, who have reached the age of majority in their state or territory of residence at time of entry. Legal residents of Canada (excluding Quebec) who have reached the aforementioned age in their province of residence at time of entry are also eligible to enter. The Entry Period is beginning on October 10, 2017 at 12:01 AM (ET) and is ending November 27, 2017 at 11:59 PM (ET). Winner will be selected on or about November 28, 2017 in a random drawing from among all eligible entries received. Winner will receive 2 tickets to the 2018 Woman’s Day Red Dress Awards on February 6th, 2018 at Lincoln Center, New York, NY and a check for $1,000. For the name of the Winner, send a separate self-addressed, stamped envelope to Woman’s Day 2018 Red Dress Awards Sweepstakes Winners’ List, Hearst Communications, Inc., 300 West 57th Street NY, NY 10019 within 2 months from the Winner notification date.